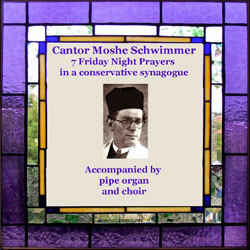 Notes In this album created by the Judaica Sound Archives® from Cantor Schwimmer's “home recordings,” his lovely baritone voice is heard to good effect. Devoted to seven of the most basic prayers from the Friday night service the melodies are mostly from the great cantorial composers, such as Sulzer, Lewandowsky and Dunajevsky. He is accompanied by both organ and chorus.